Let’s face it – we all want to look younger. While having that beard may make you look distinguished, you may want it to look a bit bolder, fuller and darker. To that end, beard coloring is going to have to be your best bet. There are all manner of beard coloring companies out there, all clamoring for your money – you might want to find some alternatives in case whatever you might have working for you right now stops getting the job done. Fortunately, we decided to take a look at five of the best beard coloring products out there to see which ones do the job right. Take a look! We are feeling extra generous today, so we’d like to provide you with a bit of a beard coloring guide. We might as well remove all of the guess work for the entire process that way once you are ready to get the dye job done there are no questions holding you back. So, it is without further ado that we present you with what you need to know to get a rad beard dye job. We aren’t so much talking about the brands of dye here, but the actual type of dye you’d like to use. All dyes that are specifically made for beards are semi-permanent. What this means is that the dye will actually wash out over a period of weeks rather than grow out. You’ll notice that the color is getting lighter with each shampoo. You can extend the life a bit by just rinsing with water though. There is always the option of using regular old hair dye for your beard as well. Hair dyes are permanent and grow out. You’ll have to deal with your roots showing and the extra amount of time with this option though. We are sure you know this, but we are going to say it anyway. Beard hair is a different animal than the hair on your head. It’s much coarser, rougher and dryer. The difference in texture makes it a bit more difficult to dye as well because the hairs don’t quite absorb the color the same. Some guys swear by picking a color that is lighter than their natural shade of beard hair and then dye their beards twice. There is a better strategy in our opinion though. We suggest that you select a color that is darker than your natural hair color and only dye it once. You will likely have better results with this method and your color will both hold better and last longer. If this is your first time dying your beard and you are prone to skin irritation, you may want to do a quick patch test. All you have to do for a patch test is apply a small amount of the dye on the inside of your arm. If you don’t have any irritation after 48 hours, you are good to go and ready to dye. If you do see some redness or other reactions, go ahead and select a gentler dye for your beard. 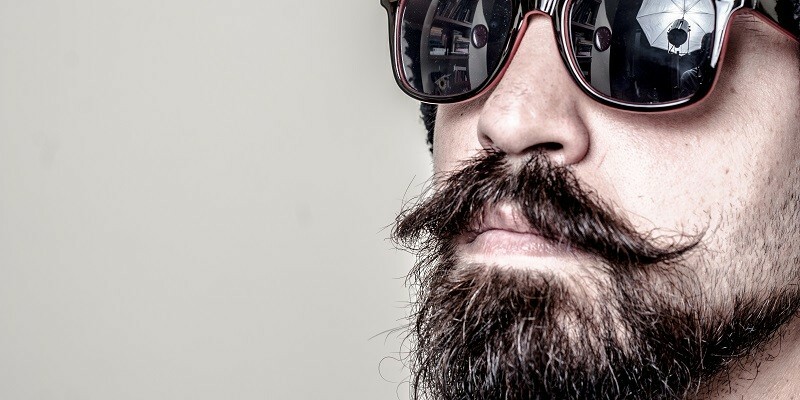 You’ll want to dye your beard when it is not freshly shampooed or conditioned to avoid any absorption issues. Applying a bit of petroleum jelly on the skin around your beard will keep you from having any odd bits of staining here and there. You are now all set and can apply the dye according to the directions. It’s pretty standard for beard dye kits to have a brush or comb to apply the color, but if for some reason there isn’t one, you can certainly use a toothbrush instead. Your main goal is to get your beard fully saturated. Each dye option will require it to hang out on your beard for a certain amount of time and once the time is up you can rinse. That’s it! Your beard should look pretty sweet now. The thing is, those smug douches on the front? They’re right – Just for Men is actually pretty darn good as a beard coloring product, and they’re the household name in facial hair dyeing for a reason. The best part of Just for Men stuff is its ease of use – you get all the little bits and bobs needed to dye your beard, allowing you to just target the grey bits in your beard so your facial hair looks more natural. It’s also fast too – from start to finish, it probably takes about five minutes to get the whole thing going, and your beard back to its original luster. It can get a bit pricey at about $30 a box, but there are multiple applications in the box, so it’s not like you’re spending all that for a one-off. Honestly, if you want some of the most reliable coloring for your beard, don’t be afraid to go with the big guys. If you want something a little more natural, without all the artificial dyes and machine-made ingredients, you might want to check out Manly Guy instead. Their claim to fame is that all of their ingredients are organic, safe, cruelty-free and natural, so you can trust that you’re not putting anything in your hair that will damage it in the long run. It certainly feels refreshing to use – there’s a lightness to the application that doesn’t come with the heavy, sticky artificial ingredients of some other beard dyes. Another thing I love about Manly Guy is just how long-lasting it is – once you put it on your facial hair, it will last up to 8 weeks before it starts to fade! The best part is, because it’s so gentle, if you need to start covering up stuff earlier, you can put it on several times per week without it interfering with anything. You can pick up a box for about $14, which makes it incredibly cheap compared to Just for Men as well. Another major company in the hair color business is Clairol, and while they have dyes for women, they have started to branch out into male hair dyes for facial hair as well. The experience with Clairol Natural Instincts for Men is pretty similar to the Just for Men – the prices are comparable (though Clairol is a bit cheaper at $20), the kit is about the same and you get enough dye to last multiple applications. I will say that I really love this dye anyway, since it simply does what it needs to do, and it lasts quite a long time – almost a month’s worth of shampoos can go by without you starting to see any loss in color. Your hair also feels pretty great when you use it, since Clairol puts in some fortifying ingredients that will help strengthen your facial hair – something that can actually be a concern, even with beards. Anyway, the Clairol stuff won’t thrill you overmuch, but it definitely does what it’s supposed to do, and won’t leave you wanting. If you’re not afraid to get in touch with your feminine side, you can always try Godefroy Eyebrow and Face Hair Tint Kits – Godefroy’s a company that specializes primarily in coloring for women’s eyebrows, but have been expanding their products to cover facial hair as well (after all, hair is hair, right?). This kit is a bit more stripped down than the other products we’ve seen so far, but boy does it deliver. It’s made with pure white henna, which is a wonderful natural ingredient that ensures beard health, and the consistency is actually quite great. There are 20 applications in the box, which is great, though that technically is for eyelashes; unless you’ve got the thinnest beard in the world, it’s probably more like 10 applications. Finally, we have Harvest Moon, which is like Manly Guy in that it specializes in all-natural beard coloring; this stuff is actually vegan, so if you’re so inclined, this may be the product for you (warning: do not eat it). Every packet you get can give you up to 40 uses, which is absolutely incredible, since a single pack could last you six months to a year! What’s more, you can get a pack for about $10, which is an incredible steal and probably the best deal you can get on natural beard coloring. I’d be hard pressed to find a better beard dye than this one due to its combination of price, quality and longevity – it’s just that damn good.